Stonehenge Campsite and Glamping Pods in Wiltshire is the most Beautiful Small Gold & Multi Award Winning Glamping Campsite. It is perfectly situated close to Stonehenge, Longleat Safari Park, Bath, Devizes, Wilton, Salisbury, Stourhead & The New Forest and an ideal touring base for South Wiltshire. We are a very friendly, well laid out campsite and have over 500+ positive reviews. We are a secluded, rural campsite in a semi woodland setting. With outstanding walking, woods, streams, 2 pubs and an excellent farm and village shop all close by. Enjoy the peace and quiet. Peaceful with woodland and open fields all around which is teaming full of wildlife and bird song in the morning & Owls & Bats at night. During the day see our Jacobs & Horses and help us to hand feed our pet Alpacas! Across the valley there are dairy cows on the Druids Lodge estate and arable fields all around. You can also walk or bike to Stonehenge direct from our campsite across the Druids Lodge Estate. 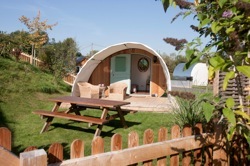 The Glamping Pods are quite unique and this is demonstrated by the multiple tourism industry and Green awards we have won to date. We are also proud winners of the prestigious David Bellamy GoldAward – one of an exclusive club of only 460 sites in the UK as well as a Top 100 UK Campsite for 2014 one of the best 100 Campsites in the UK and one of only 8 sites in Avon Somerset & Wiltshire. We are also one of the 1st campsites in the UK to win a Trip Adviser Excellence Award for 2013 & 2014 and 2015! Try something very different – break your family and friends in gently – bring your parents or grand parents and treat them to some luxury while you camp next door! Surprise a friend or partner – perfect for that special surprise treat, honeymoon, birthday, reunion, romantic getaway, walking holiday – we can promise you they will love it. 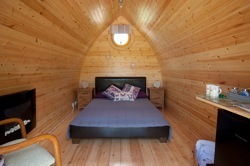 Private, cosy, heated, insulated and furnished, Wiltshire’s only Luxury Glamping Pods. Fox pod can sleep a maximum of 2 adults and up to 1-2 small children. 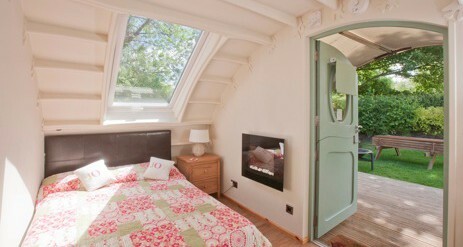 It is a wooden pod which is light and perfect for reading or just lazing in the double bed. It has lots of room and a small decked area. It has power, lighting and heating. There is also a mini kitchen, fridge, plates, cups, kettle, electric fire and 5x double sockets. The sleeping configurations consist of a double bed and a single bunk bed. Outside you can also make use of our picnic table. Moon Pod sleeps a couple and possibly one small child and is light and perfect for star gazing, reading or just lazing in lovely leather bed. It has lots of room (5m x 3m) with decked area and awning. It also has a heater, mini kitchen, plates, cups, fridge, kettle, toaster and picnic table. 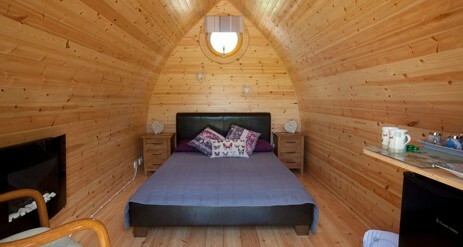 Eden Pod sleeps a couple and possibly one small child and is light and perfect for star gazing, reading or just lazing in lovely leather bed. It has lots of room 5m x 3m with decked area and awning. It is warm with lots of insulation, heaters, mini kitchen, plates, cups, fridge, kettle, toaster & picnic table. This Butterfly Pod is suitable for two adults and possibly one small child. It is a wooden pod which is light and perfect for reading or just lazing in its lovely leather bed and has a small decked area outside. It has power, lighting and heating. There is also a mini kitchen, its own fridge, plates, cups, kettle, electric fire and 5x double sockets. The basic good value Festival Pod is available from just £35 – £40 per night. There is the option to add electric hook up to the unit and it is suitable for two adults or 2 older children. It has two single beds or can be slotted together to make a double bed. 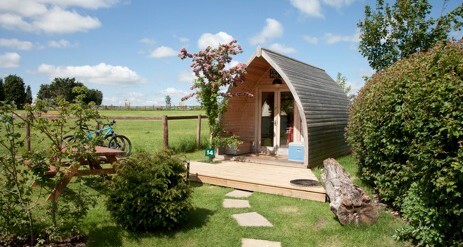 Perfect if you are staying in a Glamping Pod but have older children who would like their own space! 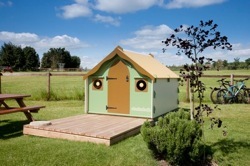 Or maybe your family are camping in tents but you would like the comfort of a bed! 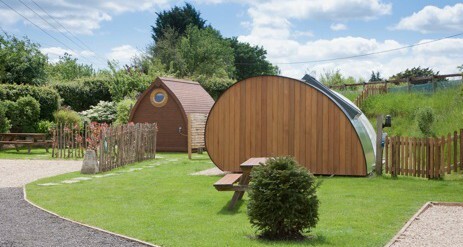 The Hobbit Pod is the latest addition to our pod family. 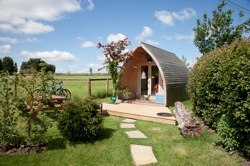 Designed by Landpod innovative glamping company. 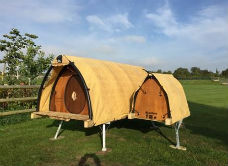 The Hobbit Pod is a comfortable raised pod on a firm base with a solar power pack, USB charger ports and LED light. It includes a double bed (bring your own bedding). We provide a secure, lockable box for your more valuable possessions. 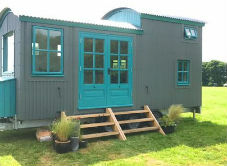 Located within its own fenced garden area with picnic bench, it is ideal for campers who would like to put parents in the pod and children in a tent inside the plot (or the other way around!) The sides of the pod can be independently rolled up for lazing with a vista out of the tent on sunny days. An attached Pet Pod means your four-legged friend is kept warm and dry in their own secure pod. 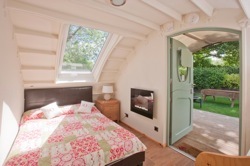 Our pretty Shepherd’s Hut offers comfortable family accommodation sleeping four. High children’s bunk (standard double) and low adults’ bunk (kingsize) are included and a third child could stay if you provide your own camp bed. Other facilities include seating and table for four to five, a two ring gas burner, mains electricity, a camp kettle and basic cooking equipment as well as cutlery and plates. There is no fridge so please bring coolbox! PLEASE BRING YOUR OWN BEDDING AND TOWELS FOR ALL ACCOMMODATION – Duvet, pillows, towels and bottom sheet for double bed! 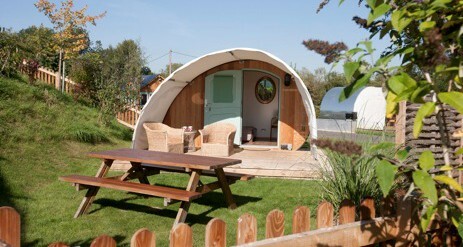 Stonehenge Campsite and Glamping Pods have a great range of facilities to make your stay with us even more enjoyable. From our brand new shower blocks and washing facilities to our fantastic friendly helpful wardens, we think we have everything covered to make your stay one of the best stays you’ve had! 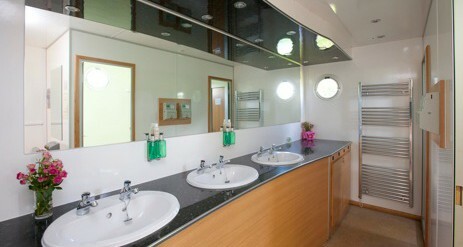 We have recently won a Platinum Loo of The Year award! There are 4 showers (2 ladies/family and 2 gents,) 8 sinks and 7 WCs at present. There is a small charge of 20p for the showers and all money is donated to our charity The Wiltshire Air Ambulance. This is one of the unique things about our campsite. We are the only campsite in Wiltshire that allow real fixed open campfires. On the Campfire Field & Meadow Field we have 4 fixed campfire pits and plenty of mobile fire pits for hire for just £20.00 per night which includes a large bag of logs. Charcoal may also be purchased on site. We do not allow disposable BBQ’s but you may hire a fire pit to cook on if you wish?